The third and final volume of Graves’s life of his uncle (begun with Robert Graves: The Assault Heroic, 1986) completes the full, febrile metamorphosis of Robert Graves into a romantic, “muse-inspired” poet. This volume opens just after the tumultuous collapse of Graves’s stormy 14-year relationship with the American poet Laura Riding. Although Riding had guided and inspired some of Graves’s best work—including his WWI autobiography, Goodbye to All That, and his historical novel, I Claudius’she now scorned him and his work bitterly. Since Graves had always worked best when in love, it wasn—t long before he tried to salve his wounds with another young woman—the long- suffering Beryl Hodge. Although it would be almost another decade before Graves divorced his first wife, Nancy, he and Beryl soon settled down to domestic life. 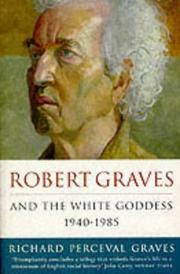 During the war, between minor novels, criticism, and scattered poetry, Graves wrote The White Goddess. This long, fiendishly involuted descant on the poet’s wells of inspiration, full of gnomic musings on trees and goddesses, managed to create for Graves a cult following that lingers to this day. After the war, on his beloved Majorca, Graves acted out his theories by ignoring Beryl and falling in love with a succession of beautiful young women, imbuing these —muses— with the mystical, hortatory powers of the Great White Goddess. These muses usually repaid his obsessive attention with distance and spite, spurring him on to even greater poetic effusions. The wonder of it is that from these silly, self-involved infatuations came some of the best love poetry of the late 20th century. If this biography has any flaws, they are its stupefying length and perhaps its overly narrow focus: The spotlight on Graves is so bright that it’s sometimes difficult to fully appreciate the important supporting players. But these are quibbles. Richard Graves has created a monument to a monument.